Prof Sheila Pankhurst, kicking off, points out that Salford University exists to develop technology useful to business and industry. Peter Morgan, BEIS, giving a status update: ~13m SMETS1, 250k SMETS2 installed. 1M/qtr installed in 2018. Summary of data flow chain: home, DCC, DCC service users. DCC has 99.5% GB contracted coverage target. Arqiva in north (434MHz), Telefonica central and south over cellular. In home, ZigBee on 2.4GHz should cover ~70% of homes. 868MHz should take coverage into ~95%. "Alternative HAN" for the rest, eg relayed over mains. Data access route 1 via DCC, no additional equipment required, HH gas and electricity and tariff info. Visible opportunities range from automated supplier switching to ToU tariffs. Question from the audience: can water metering be fed into the DCC system? A: by design only electricity and gas are included. The likely 'sleepy' nature of water meters (like gas) adds technical issues. Conceptually, however, no huge technical barriers; legal and cost/benefit yes. Question from the audience: for newer tech that does not need to take data out of the home, is user consent still needed at least in the same way? A: for example DNOs put forward privacy plans to show safe way to access bulk data without such individual consent. Criticisms levelled at smart metering system: complexity and privacy concerns. What do smart meters look like now and in the future? DCC is a centre of trust. At the grid edge are the meters and hubs. The smart meter has some metrology (sampling voltage and current, analogue-to-digital, etc), WAN comms, HAN over ZigBee, and the tabloid-demonised remote disconnect switch. But also quite a lot of computing power too, at this part of the grid edge. The microprocessor is key to the security of the system; crypto, tariffs, OTA updates, etc, etc. Two key features: safety and security. UK smart meters must be capable of delivering 100A (24kW), which is tricky in a small box! Security and data privacy: the meter is national critical infrastructure. Smart charging (eg of EVs) and ToU tariffs, and demand control. SMETS is a minimum standard: it should be possible to built smart charging as an extension service on top. We could let industry innovate freely, which may be fast but confusing. Support for microgeneration and local storage. Again, may wish to extend SMETS. Growth of intelligent device market. ~27M UK homes, SMETS1 transitioning to SMETS2 to cover all UK homes, ~27M sets so ~100M devices. Lots of microgen, chargers, etc, maybe another 100M devices. Shades of IoT, but with security requirements clearer and more critical than in many other IoT uses. Urging government to legislate and regulate for outputs, not just protocols. L+G proposes plug-in (smart meter) module for intelligent devices, including third-party products. Question from the audience: there seems to be a shortage of 3-phase SMETS2 meters; will L+G make them? A: yes. Will the L1/L2/L3 readings be separately available? A: don't know. Simon Harrison, Design Director, Smart DCC. DCC: Data Communications Company. Wholly-owned subsidiary of Capita. DCC is a public monopoly, licensed to provide a public good. Scale: will touch every property in the UK, securely. "Other" DCC users include "research", but may be only 2 or 3 in total so far! Even the light-touch version is quite involved, starting with becoming a party to the Smart Energy Code, and includes a data security audit. Trying to make the 13M SMETS1 become interoperable (eg virtualised SMETS2). Working with many partners including universities such as Salford, Chester, UCL to get innovation. Many areas other than just the bald data, such as APIs, access within the home, access outside the home and at what granularity (eg bandwidth issues). Innovation hub plans: eg rooms where manufacturers can plug into DCC stuff and test interop for example. Also access to anonymised HH data soon? Less nailed down than the core business. First physical HCALCS for switching loads such as storage heating between networks remotely over SMETS2. Dr Richard Fitton, University of Salford Applied Buildings and Energy Research Group: Energy House 2 and existing EH1 and smart meter lab. Smart meter ecosystem including bidirectional EV charging. IEA Annex 71 forecasting, disaggregation, etc. Very engaged with industry, not head-in-the-cloud academic! Interesting and frank round-table meeting with BEIS, manufacturers, etc, to see what is required to progress actual consumer use of smart metering. Joule House (where he did some of his work) Grade II listed. Very appropriate given the unit of energy named after him. Very difficult to hack around a listed building to support PV, batteries, etc! 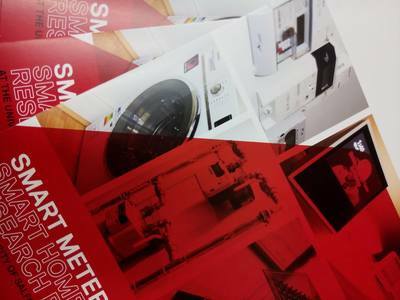 Smart Meter research lab with range of SMETS1 and SMETS2 meters, with access at various places in the chain, and ability to vary parameters such as tariffs. There is a 'smart' living room with 'smart' consumer equipment, eg smart TV. How do get data there from the smart meters, eg on the Playstation? This is not the DCC lab: it's how to get smart things to talk smart meters, and get the smart meters to do interesting stuff with those smart things. This smart home has a smart living room and a smart kitchen down the hall. Separate electricity and gas from rest of building for monitoring. Current projects: NDSEMIC (real-world non-domestic building performance), HAVEN (vehicle to home and grid bidirectional charging and automation). TEIF: compute a live EPC rating. HCALCS: with Octopus (see below). Coming Soon: smart meter hackathon, teams from academia and industry. Question from the audience: no mention of human factors? A: Dr Fitton's group is building physics focussed. Social science people at UoS can help. Agile tariff, full 30 mins (HH) ToU pricing, published 24h ahead. How to get customers to make use of ToU, including -ve ("plunge") pricing? Bill shows an average p/kWh price on front (and 30 pages of detail behind). Customers shifting consumption away from 4-7pm do see lower bills. EV users show biggest sensitivity to price signals. The customer load curve has clearly shifted in response to using Agile. There is a good parallel to the plastic-bag charge and behaviour change. Very hard to give an accurate bill projection. And behaviour change is needed. Octopus tries to educate customers before they switch to the Agile tariff, and switching away has no penalty if it doesn't work for them. Agile tariff has an API including historic data for the account. On windy 2018/12/08 Agile was paying -2.2p/kWh, cf big six charging ~17p/kWh. HCALCS: send control signals via smart-meter back channel rather than Internet or other telco. Will continue to innovate with smart metering, Agile, storage will be important. Question from the audience: will Smart Export Guarantee (with guaranteed positive sell prices) kill negative Agile pricing? A: yes, maybe. Question from the audience: can Agile work on prepayment meters? A: no. Octopus blog post 2019/02/03: An update on the smart meter rollout: "... for February, March and maybe a bit longer, we are not able to install smart meters as effectively as we were doing until now." Josh Cooper, Hildebrand. Glow platform. Hildebrand is all about allowing non-desktop-computer CAD interaction with home and Internet. Hildebrand can be a proxy for innovators. Offerings to energy suppliers, developers, partners, researchers. There are 13 months of history on a smart meter, available via CAD. The meter knows about price changes, so can in principle talk to the washing machine or dishwasher to trigger washes, etc. Validating/verifying user identity outside of the supplier route. Can accept AMR (especially non-domestic) and manual reads. HTC in real-time (heat transfer/loss from building). Collected more than 450 billion data points so far! Glow dev portal includes smart meter data, but well beyond that too. Glow hosts jupyter notebooks for developers. Help consumers select reasonable goals based on 13 months of history. Working with UoS on "middle out" approach on tools for energy users, though apps such as Assure. Iagan MacNeil, Head of Policy Smart Energy GB. 71% of users would recommend smart meters to friends and family. Users are making use of the data to monitor or improve efficiency, from turning lights off to informing appliance replacement. Users of all ages were interested in automation, and spotting underperforming appliances, and cheaper energy. Consumers don't want gimmicks: products/services have to make a real difference. Could energy be sold as part of a lifestyle package? Half of people thought so. Like buying a TV/phone/broadband package, simplifying life admin. Many would like to buy such packages from telcos and supermarkets. Making life simpler is an important pull from consumers, as is trust. Question from audience: does this life simplification clash with disaggregation? A: suggested different customer groups for these two? Question from audience: would like to understand more about simplification, what do people most want to be rid of. A: comparison shopping, direct debits, mundane renewals, household chores; life admin. Enthusiasm for new tech, but concerns with security and privacy. Transparency and control are key for the consumer. Protections currently in place include default of one energy reading per day. Will Intellectual Property Rights and enforcement (eg DRM) trump or at least cramp consumer rights? How does the energy market serve people without higher degrees, vulnerable people for example? Especially in developing and complex tech areas. Dystopia: an insecure disconnected Internet of proprietary things? Utopia: open, interoperable, Internet of consumer-friendly things? Dr Richard Jack, Build Test Solutions. Looking for new tech to measure building performance. Space heat demand will be electrified, and follows electrical peak demand. Difference between as-designed and as-used thermal energy performance. That gap can be big (10s of percent). Buildings not just designed for energy efficiency, but rather utility, comfort, safety, health. What to measure: air tightness, elemental U-values, whole-house W/K heat loss. Lots of parts to measure to get these values, lots of equipment and time too. Smart meter data and HDD (Heating Degree Day) and maybe smart thermostats... Allows for longer-term less-invasive more comprehensive data collection, but requires some smarter analysis with lower-quality (but more) data. Who's the customer for this data? Energy cost doesn't include all the externalities in the pricing, so home owners are not very motivated. Supporting such new schemes such as HaaS (Heating as a Service). David Richardson, Innovate UK. Whole system and multi-vector integration. Smart meter programme based on estimates of 3% electricity and 2% gas savings. Generation, transmission, storage, etc, as a whole. Looking for world-leading energy systems design for specific UK location, link supply, distribution, storage, demand control. Should be intra-day up to inter-seasonal. Also Gill Kelleher of Specific (Active Building Centre) describing buildings with PV that don't need gas, etc. Future energy models can't cope with active building and (for example) the avoided need for a maintained gas grid. Amongst others there it was good to see Graham Oakes ex-Upside, and Adam Fudakowski of Switchee. 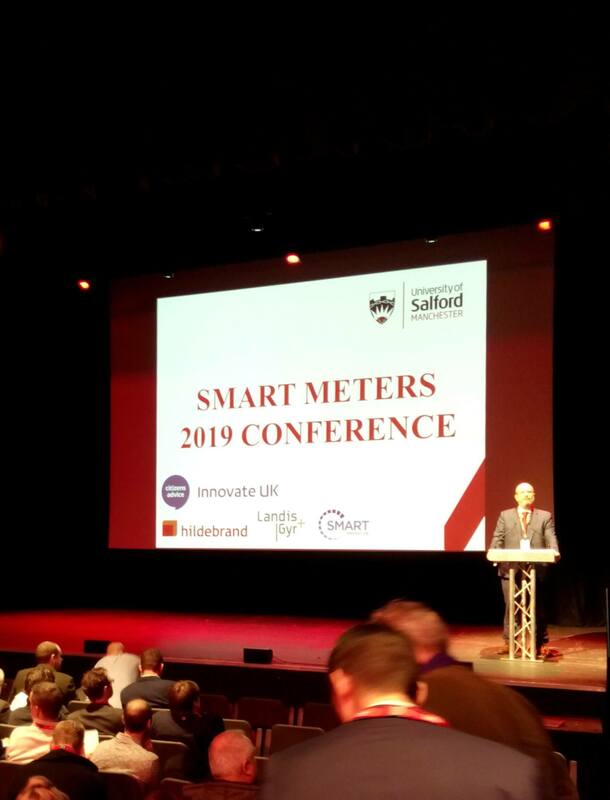 They are provided on the main page of the above link under the accordion tab titled ‘Smart Meters 2019 Conference’ (please scroll down the webpage to see it). University of Salford Applied Buildings and Energy Research Group. First published 2019-02-07 , updated 2019-04-22 . Site copyright © 2007-2019 Damon Hart-Davis. Hosted by ExNet.